CALAIS, Maine — Forecasting some of his priorities for 2012 and the rest of his term, Gov. 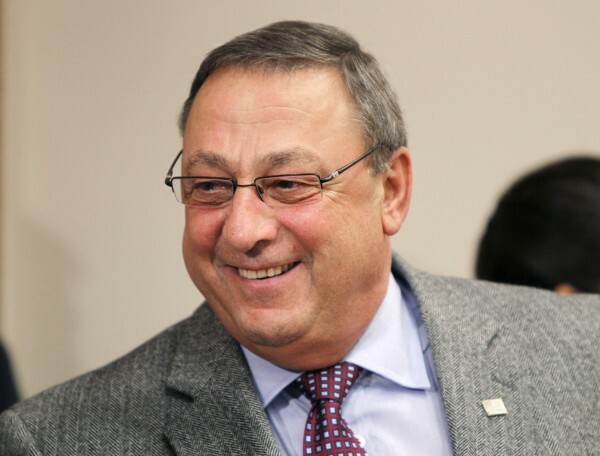 Paul LePage pledged Friday to work to eliminate state income taxes on retiree pensions and said he believes natural gas could be a reality throughout much of Maine within three years. LePage faced a friendly crowd of more than 100 people on Friday night during a town hall meeting held on the Washington County Community College campus during the final stop of his “Capital for the Day” tour of far eastern Maine. The Republican governor used the forum to stress the need to lower Maine’s energy costs and to strengthen vocational and technical education programs in public schools — two reforms that LePage said would be key to attracting and retaining businesses in Maine. The latter is a point he said was drummed home during a recent Blaine House event with business leaders. On the issue of energy, LePage reiterated his belief that expanding access to natural gas and reducing Maine’s reliance on heating oil is the most significant step the state can take to reduce energy costs that are more than 40 percent higher than the national average. Earlier Friday, LePage had visited the Woodland Pulp LLC paper mill in Baileyville, where a new pipeline is under construction to bring natural gas to the facility, allowing a fuel conversion that company officials predict will pay for itself within a year. The governor said his administration plans to talk with natural gas suppliers in both the U.S. and Canada and that he plans to discuss with legislative leaders ways the state can help extend gas infrastructure to more homes and businesses, perhaps by working with utilities. He also set an ambitious goal. “I believe we can get natural gas throughout the majority of the state of Maine in the next three years,” LePage said, eliciting energetic applause from the crowd. During the next legislative session that begins in January, the LePage administration plans to sponsor legislation to eliminate the state income tax on pensions as a way to help lower-income elderly Mainers and woo retirees to establish residency here. While such a proposal likely will find considerable political support in the GOP-controlled Legislature, it might be a tough sell to some lawmakers on the budget-writing committee already grappling with an unpredictable revenue stream. Because Maine’s constitution requires a balanced budget, revenue losses from tax cuts must be covered in some other way. Friday’s gathering in Calais was significantly friendlier than some of the past town hall meetings that LePage has held around the state, which is perhaps not surprising given Washington County’s more conservative political leanings. Unlike past events, there were no protesters and LePage was not forced to field any hostile questions from the crowd. Instead, several speakers praised the LePage administration’s performance so far — sentiments that many in the audience appeared to share, judging by the level of applause. Other speakers questioned LePage and his Cabinet members about what they were doing to improve Maine’s road infrastructure, address Maine’s high rate of prescription drug abuse and how the administration can help small farmers. On the issue of drug abuse, the governor talked briefly about his bill to stiffen the penalties for those selling the synthetic drugs known as “bath salts” that are causing major problems on the streets and in the hospitals of an increasing number of Maine towns and cities. He said his administration is also talking with hospitals and doctors about ways to reduce prescription drug abuse but did not go into details. “I don’t disagree that it is a serious problem and is not getting any better,” he said. Education was another popular topic. Responding to a question from the crowd, LePage restated his support for allowing parents to choose where to send their children to school as well as for charter schools, which recently were authorized by the Legislature. Education Commissioner Stephen Bowen said he believes the state needs more flexibility in allowing districts to work together administratively and offer school choice without necessarily merging, as was attempted through the Baldacci administration’s controversial school consolidation exercise. LePage agreed, saying he believes some districts could have consolidated administrative and “backroom” functions while allowing local school boards to remain intact.